Prof. M. P. Manmadhan (late) – the eminent sarvodaya leader and social worker came to know about Sri. Govinda Marar from a speech delivered by the great Malayalam poet Ulloor S. Parameswara Iyer.He decided to setup a suitable memorial to the saint musician at his birth place at Ramamangalam. The Shatkala Govinda Marar Smaraka Kala Samithy took birth under the chairmanship of Prof. M. P. Manmadhan in 1980. The Samithy engages in the establishment of several institutes to promote the study of traditional music and temple arts of South India with facilities for advanced research in all branches of arts and music. After the demise of Prof. M. P. Manmadhan, Sri. C. Radhakrishnan (writer, film director), Sri. M. P. Gopalakrishnan (Rtd. R. D. O.) 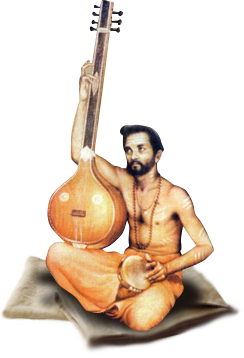 and Prof. Mavelikkara Prabhakara Varma (musician) lead the Samithy. Prof. George S. Paul (renouned art journalist and columnist) is presently leading the Samithy. A memorial building consisting of class rooms and auditorium had setup wih help of Central/State Governments, Local Self Government Institutions and well wishers in the vicinity of the famous Narasimhamoorthy Perumthrikkovil. Classes have been arranged to impart training in classical music (vocal and instrumental), classical dance and temple arts.